^ Química.urv.es. Leche. [2008-01-11]. （原始内容存档于2008-03-27） （西班牙语）. ^ 2.0 2.1 Delaval.com.ar. Leche. [2008-01-11]. （原始内容存档于2008-04-26） （西班牙语）. ^ Costaricalinda.com. Mamíferos de Costa Rica. [2008-01-11]. （原始内容存档于2008-06-27） （西班牙语）. ^ Ua-cc.org. Nutrición y salud - Lácteos (營養與健康 - 乳製品). [2008-01-11]. （原始内容存档于2008-01-20） （西班牙语）. ^ Vanguardia.com.mx. >> Omnia: Tipos de leche. [2008-01-11] （西班牙语）. ^ 乳的pH值与酸度及异常乳的概念和种类. 石家庄乐牧贸易有限公司. [2014-01-27]. （原始内容存档于2014-02-03） （中文）. ^ 母乳喂养的好处. 中国乳制品工业协会. [2014-01-27]. （原始内容存档于2014-02-02） （中文）. ^ McGee, Harold. Milk and Dairy Products. On Food and Cooking: The Science and Lore of the Kitchen 2nd. New York: Scribner. 2004: 7–67 . ISBN 978-0-684-80001-1. ^ Goff, Douglas. Dairy Chemistry and Physics. Dairy Science and Technology. University of Guelph. 2010 [8 February 2011]. ^ Fox, P. F. Advanced Dairy Chemistry, Vol. 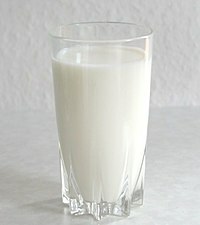 3: Lactose, Water, Salts and Vitamins. 2nd ed. Chapman and Hall: New York, 1995. ^ Goff, Douglas. Introduction to Dairy Science and Technology: Milk History, Consumption, Production, and Composition. Dairy Science and Technology. University of Guelph. 2010 [8 February 2011]. ^ Milk contains traces of ash. Chennai, India: Hindu.com. 2008-07-10 [2010-08-28]. ^ Milk From Cows and Other Animals, web page by Washington Dairy Products Commission. Havemilk.com. [2010-08-28]. ^ USDA National Nutrient Database for Standard Reference. Ars.usda.gov. [2014-01-27] （英语）. ^ 乳糖不耐症. 行政院國家科學委員會. [2014-01-27]. （原始内容存档于2014-01-26） （中文）. ^ Campbell, Malcolm. Fact Sheet: Milk Fungicide. Australian Broadcasting Corporation. September 19, 2003 [April 1, 2009]. （原始内容存档于2016-08-18）. ^ Phipps, Nikki. Milk Fertilizer Benefits: Using Milk Fertilizer On Plants. www.gardeningknowhow.com. [June 3, 2015]. ^ Drop of white the right stuff for vines. Science Daily. September 12, 2002 [April 1, 2009]. ^ Wagner Bettiol, Brenno Domingues Astiarraga and Alfredo José Barreto Luiz. Effectiveness of cow's milk against zucchini squash powdery mildew (Sphaerotheca fuliginea) in greenhouse conditions. agrar.de. [June 3, 2015].